I haven't written up any family dinner posts for a while, but, obviously we are still cooking family dinners almost every night of the week! With two toddlers in the house now, dinner time is certainly busy and a little chaotic, but we try pretty hard to have dinner together as a family. And seeing I don't have very much extra time, I still only like making one meal for everyone, it has worked well for us so far! 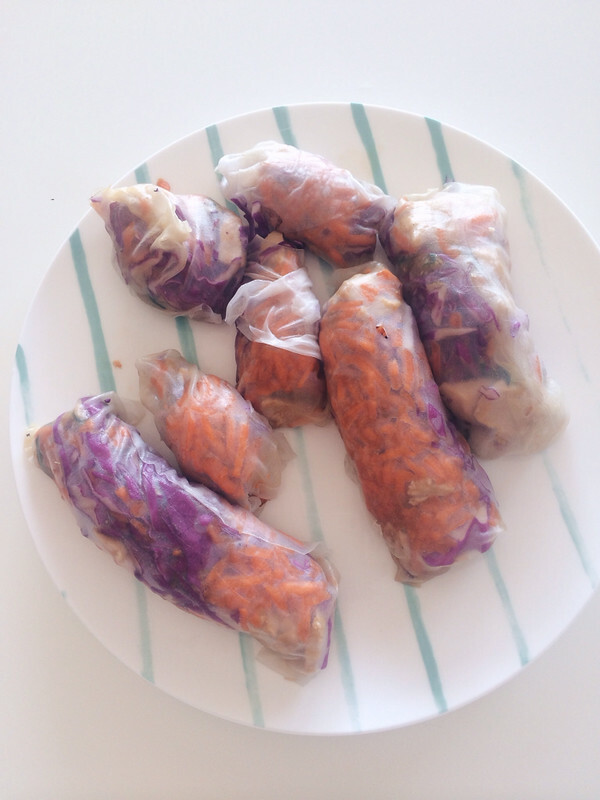 A couple of weeks ago I thought about trying out Rice Paper rolls for dinner. I had no idea how they would be received by the toddler duo! But, HURRAY, they were a hit! I know how frustrating it can be when you think, 'Oh they will love this for sure.' And, you put so much time and effort into making this great dinner, only to have little noses wrinkle up and declare, 'I don't like this', before they have even tasted it!! From Ez mostly of course, now that he is so aware of what everything is, and very wary of NEW things. Thankfully Willow eats everything and I mean everything, and LOTS of it. But still, trying new recipes can be a little daunting sometimes, and can open you up for a dinner time disaster. 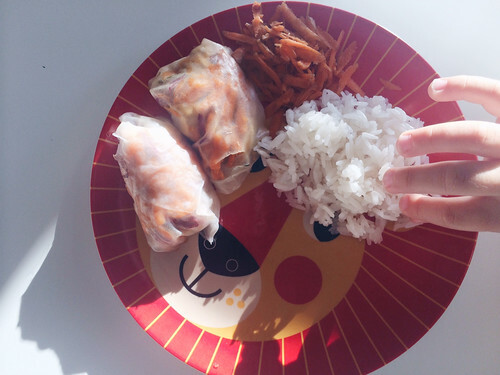 These rice paper rolls are super easy, and great for the whole family! But, I am terrible at wrapping them, so just have a little giggle at how munted my rice paper wrapping is. Especially because this time I tried to cut them in half to make mini ones for the kids, I think leaving them whole and just putting less filling in would probably have been a wiser move on my part. I've made them twice now. This made two large rolls for 2 adults and one each for the kids!! 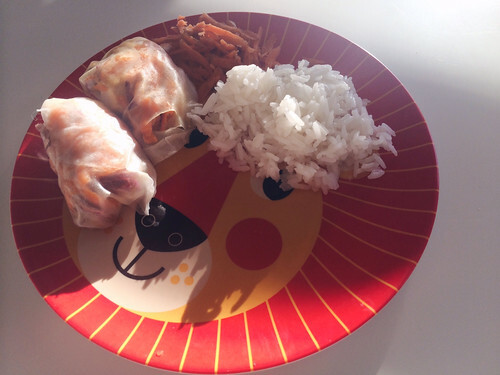 I just added a little bit of everything in each one and wrapped them up, with a little soy dipping sauce. I also added some Brown rice for the kids! I served them with some Jasmine rice for the kids this time! A relatively easy dinner, and I think they will start on the regular dinner rotation! 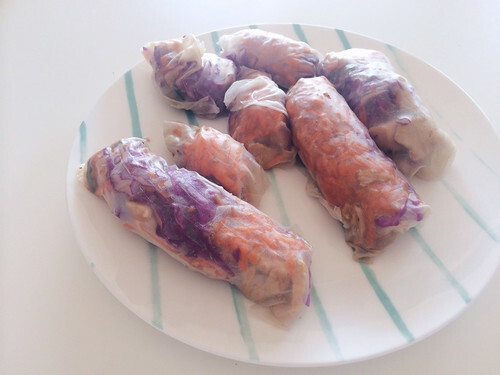 2 comments on "Family Dinner Ideas: Chicken Rice Paper Rolls"
These sound really yummy, Karen. We'll have to try them. Right now charlie is mainly eating cooked veg, except cucumber. He loves the cucumber. He wrinkles his nose at a lot of new things and it's frustrating, like you said! to learn more ways in meal planning. I'll tell you, it's really effective.